Foundation Press. Hardcover. 1628100591 Brand New! Usually ships within one business day! 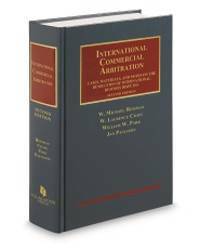 This item is: International Commercial Arbitration, Cases, Materials, and Notes on the Resolution of International Business (University Casebook Series), Reisman, Craig, Park, Paulsson; 2nd ed., 2015; hardcover; ISBN: 9781628100594. For fastest delivery, choose Expedited Shipping. We represent the Internet's largest independent legal bookstore! . New.